CSEAS Film Series. 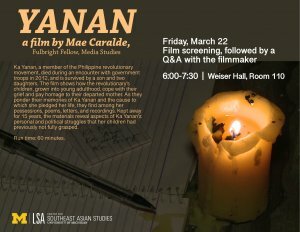 “Yanan,” a film by Mae Caralde. Film screening followed by a Q&A with the filmmaker. Ka Yanan, a member of the Philippine revolutionary movement, died during an encounter with government troops in 2012, and is survived by a son and two daughters. The film shows how the revolutionary’s children, grown into young adulthood, cope with their grief and pay homage to their departed mother. As they ponder their memories of Ka Yanan and the cause to which she pledged her life, they find among her possessions poems, letters, and recordings. Kept away for 15 years, the materials reveal aspects of Ka Yanan’s personal and political struggles that her children had previously not fully grasped.